Berry Delicious: Cupcake Royale Debuts the Strawberry 66 for July! Sweet and summery strawberry buttercream swirled atop our delicious, NEW More Moisty-er! vanilla buttercake. Made with strawberries from Skagit Sun Farms, eggs and dairy from Meadowsweet, and flour from Shepherd's Grain, this cupcake is 66% Washingtonian! It's like an old-fashioned strawberry shortcake. Only better. You've waited, anticipated, and salivated. Now, the wait is over. The cupcakes are coming to Capitol Hill. We open this month at 1111 E Pike, just in time for Block Party! Watch our blog for updates. And we'll see you on the Hill! Looks like this summer is going to be totally sweet! 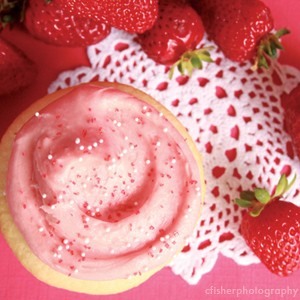 To obtain one of those delicious Strawberry 66 cupcakes, you can visit any of the three (soon to be four!) Cupcake Royale locations all July long; for more information, visit cupcakeroyale.com; for instant updates, follow them on Twitter!